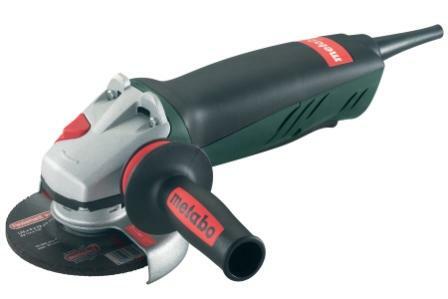 WEST CHESTER, PA - Metabo Corporation, a leading international manufacturer of professional grade portable electric power tools and abrasives for industrial, construction and welding applications, has introduced the new WP8-125 Quick 5" angle grinder with a non-locking paddle switch for safer tool operation. Ideal for the toughest operating conditions, including cutting and grinding metal or concrete, the WP8-125 Quick features a long lasting 8.0 A motor with 800 watts of power, 19.5 inch-lbs of torque and a no-load speed of 10,000 rpm. The WP8-125 Quick offers Metabo's optimum cooling technology with repositioned brushes for unrestricted airflow over the motor, allowing the grinder to work harder and longer. With one of the most effective dust protection systems on the market, the WP8-125 Quick features an encapsulated on/off switch, auto-stop carbon brushes, double-lipped labyrinth sealed bearings, Metabo's unique dust-deflection winding protection grid and epoxy coated field coil windings. Weighing only 5.4 pounds, this lightweight grinder features a secure 'racket' grip with dual grip zones for comfortable, ergonomic handling. The WP8-125 Quick's VibraTech side handle absorbs up to 60% vibration, allowing the operator to hold the tool longer, resulting in fatigue-free operation. The WP8-125 Quick's toolless wheel change system increases operator efficiency and saves time and energy when replacing wheels. The tool offers other safety features including a toolless locking wheel guard with seven positions, spindle lock, S-automatic safety slip clutch to help protect the operator from kickback by absorbing the torque created should the wheel bind or snag, and a deadman function that turns off the grinder immediately when it is released or dropped. Optional equipment for the WP8-125 Quick includes a Type 1 Cut-off Wheel Guard and Metabo's Dust Director Tuck Pointing Guard.